Ivacy, a cybersecurity company, introduces its very own Kodi add-on to meet growing demand from Kodi users for security, anonymity and unlimited bandwidth. SINGAPORE, February 15, 2018	(Newswire.com) - Ivacy has introduced a new update for its Kodi add-on, which is much easier to set up. In fact, it is just as easy as setting up any other third party add-on on Kodi. Accessing content is not all that difficult these days, but there are restrictions that prevent internet users from remaining secure and anonymous. Kodi users have been itching for a solution to overcome these very same concerns, and it seems that Ivacy has finally come through with a new update for its Kodi add-on. Once the latest update has been installed, Kodi users will for now at least, benefit from a few basic features along with a few advanced ones to better their viewing experience. View details regarding the connected VPN server, including location and IP address. Choose from one of many available VPN servers from across the globe, or simply disconnect from connected VPN server. It will allow certain traffic to be encrypted, while excluded add-ons’ traffic will flow as it always has. Gain access to additional sub-categories i.e. VPN Configuration, Monitor and Split Tunneling. You also get to benefit from greater customization for a personalized experience. Keeping the rapidly evolving cyber security space in mind, Ivacy VPN is working on improving features of all of its apps. 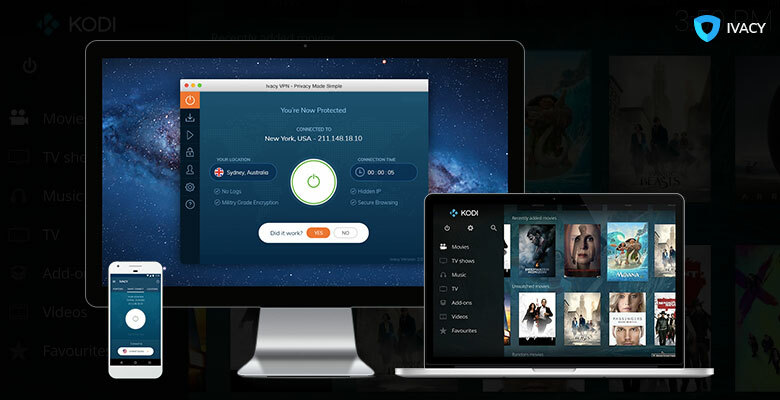 After Windows and Android, Kodi users can now rejoice with the new and improved version of Ivacy Kodi VPN. Ivacy VPN is a Singapore based entity, striving to provide convenience to its users by introducing user-centric services. As an advocate of online privacy, the company believes in total internet freedom, without compromising on privacy and security. The FIFA World Cup 2018 is taking the internet by storm, but Ivacy VPN managed to do the unthinkable by reaching an all-time high with its sales and revenue. Ivacy users now have the option to get the newly released dedicated IP add-on for a small price, thus creating new possibilities and further securing user's online presence.